Fiske Place is a quiet, single-block of Park Slope between Carroll Street and Garfield Place, one block to Prospect Park. Inside this brick building at 19 Fiske Place is a one-bedroom co-op that’s just hit the market for $589,000. 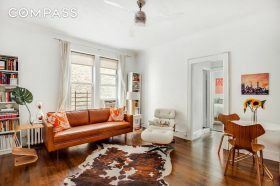 If you don’t mind a two-flight walkup, the apartment is bright and stylish, with a renovated kitchen and corner bedroom that overlooks the building’s garden. The last recorded sale for the space was in 2005 for $349,000.